LAKE COUNTY, Ind. 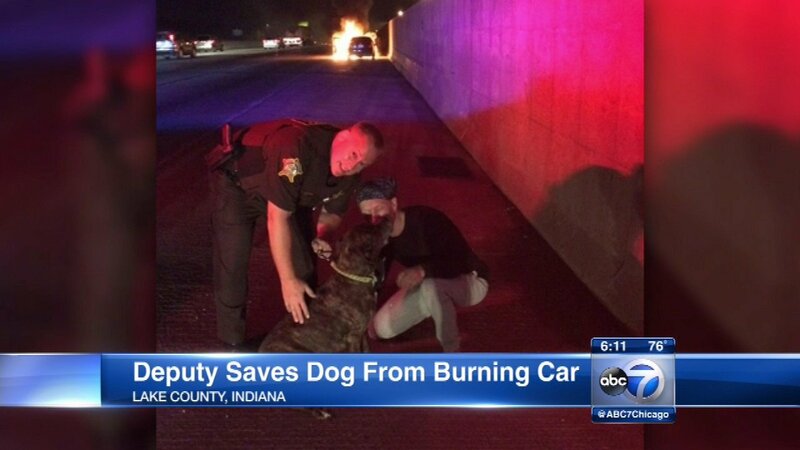 (WLS) -- A Lake County Indiana Sheriff's Deputy rescued a frightened dog that was trapped inside a burning car. Deputy Chief Dan Murchek responded to a call of a car on fire along interstate 80-94 near Burr Street. When he arrived, the car was filling up with flames and smoke. Two men escaped the car unharmed, but a dog was still inside. Murchek tried to reach the dog that was cowering on the floor behind the driver's seat. "I really didn't want to see anything happen to this dog so I just took a breath, jumped in the front seat, leaned over in the back seat, grabbed the dog by his collar and his back end, and just yanked him out before the car burned all the way up," Murchek said. The dog, named Bella, did not suffer any serious injuries.